The word ‘casserole’ is synonymous with cold, winter nights; a comforting dish for when you need it the most. But that needn’t be the case, as my recipe for Fresh Herb Chicken Casserole proves. Comforting meals are necessary all year round. Don’t confine them to only a few months. When I think of chicken casserole, vague recollections of offensive shop-bought creamy white wine sauces come to mind. A terror from my youth. Slathering tender chicken thighs in cream seems a bad idea; it is a cut with so much flavour. Instead, think of a simple chicken casserole suitable for spring and flavoured temptingly with olive oil, rosemary and generous quantities of fresh herbs, straight from the garden. This is a casserole perfect for the warmer months, inspired by Mediterranean flavours. The best thing about this dish, however, is the rich gravy sitting underneath the chicken. Flavoured with olive oil, chicken juices, lemon juice and white wine, and infused with the flavours of four fresh herbs, dipping your bread will be the first thing on your mind. And you’ll want a jolly good hunk of bread. Nothing too heavy, of course; think Italian or Spanish, not French. A well-leavened bread, with plenty of air bubbles and very little moisture is a must. The more space for soaking up those delicious juices the better. Preheat your oven to 200C/180C(fan). Heat 2 tbsp of olive oil in a large, heavy-based pan and brown the chicken, skin-side down. Remove the chicken once golden brown and set aside. Tip the onion and garlic into the pot and simmer until soft. 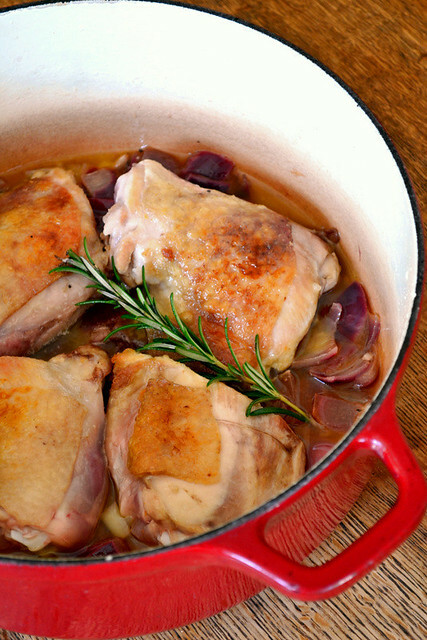 Tip the wine and lemon juice into the pan and cook for a further 2 minutes, before arranging the thighs in the pot. Mix 1 tbsp of olive oil with half the herbs and baste the chicken. Pop the pot in the oven – lid off – and bake for 30 minutes, basting the meat every 5-10 minutes. 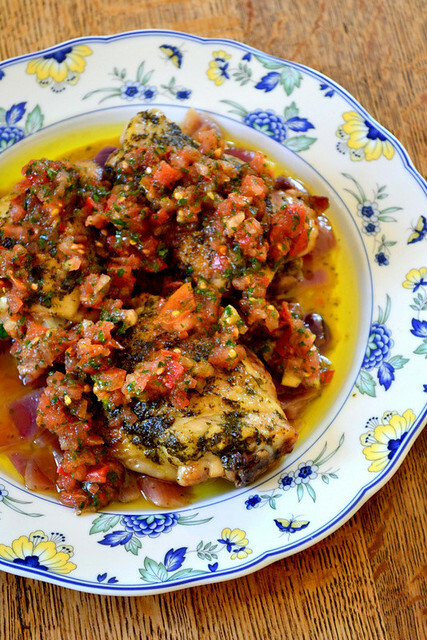 Mix together any remaining herbs and olive oil with the finely chopped tomatoes and season. Serve immediately with the tomato salsa and plenty of crusty white bread. Cost: Chicken thighs aren’t particularly expensive; certainly nothing compared to the prizes breast. And because the recipe features only a small selection of ingredients – albeit good quality – it isn’t especially expensive. You can make the whole dish for only £6, and quite possibly less! That looks extremely delish! And not too difficult either! 😀 Beautiful image. Thank you so much – yes, very simple indeed! Your photo of the pot of chicken in all it’s goodness underneath is mouth-watering! I can almost smell it. 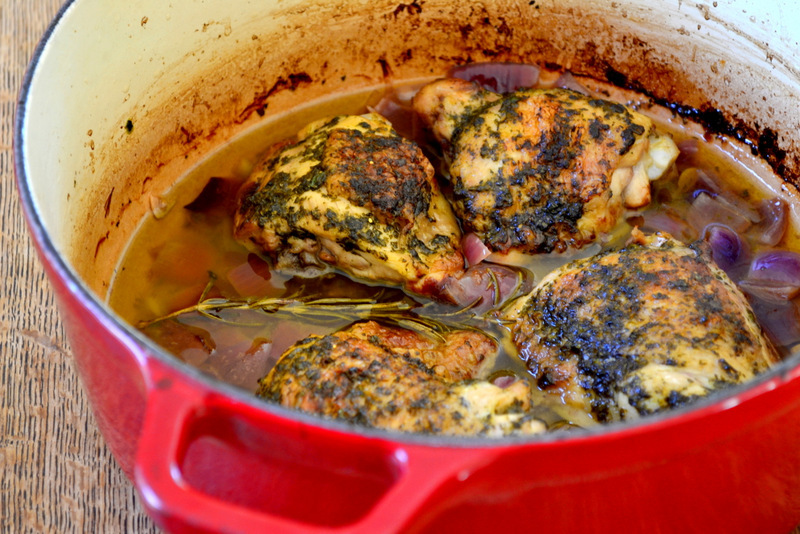 I really love this recipe and we always buy chicken thighs. We prefer them over breast meat. The goodness underneath was the best part with a hefty chunk of bread :). The thighs have way more flavour. Thank you, Jamie! It was really nice, especially with a generous hunk of bread. 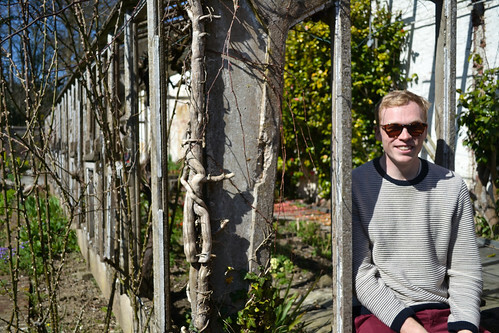 Thank you, Rosemary – my mother’s. Beautiful shot of the chicken in the red pan! 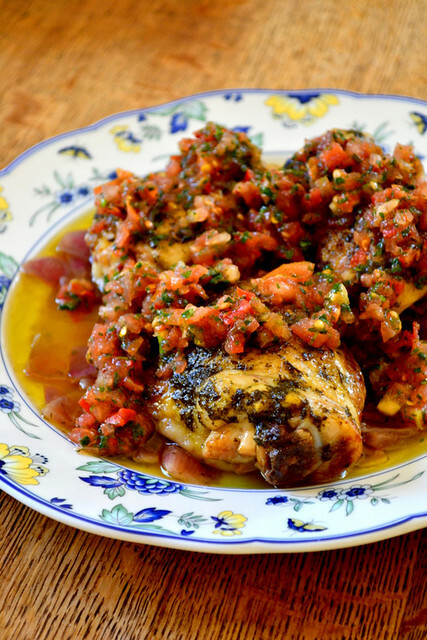 I love the herbs and juices surrounding your no doubt wonderful chicken. It looks so tender. Love it. I love that red pan, shame it my mother’s and not mine (I was visiting). Thank you! Beautiful – I agree that casseroles are not just for the winter! Chicken casseroles especially are very good for the warmer months. This recipe is truly good, my family was very happy when I prepared the tasty meal. Can you put a print function on this? I am trying to print the recipe and when I ask for the first two pages, it does not print correctly. Unfortunately, this isn’t something I’m looking into as I’d not be able to apply across all recipes easily. Additionally, printing recipes isn’t something I’m looking to encourage. Sorry!